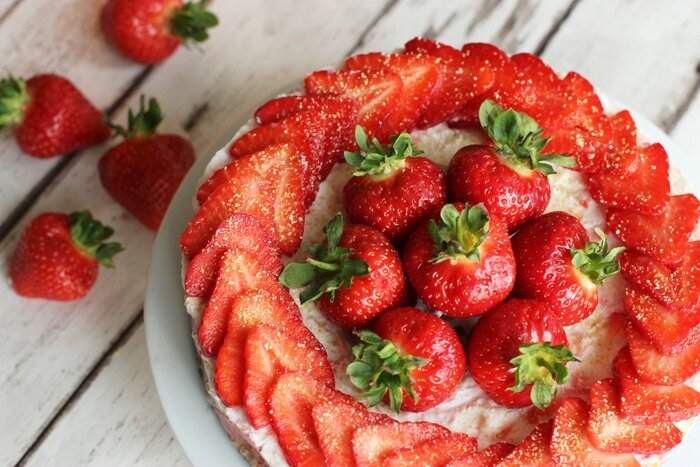 If you are a cheesecake lover then this No-Bake Strawberry Cheesecake is an absolute must-try. 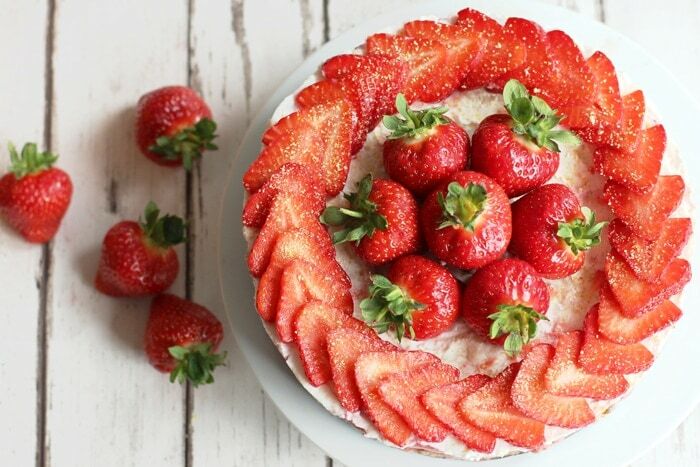 A melt-in-your-mouth light ricotta filling on a crunchy gluten-free base topped with fresh juicy strawberries. Could you ask for more? 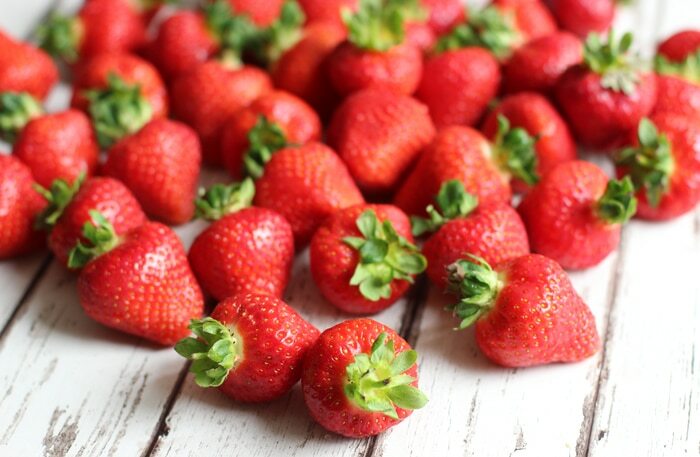 Strawberries scream summertime more than any other fruits, and there’s no better treat than a bowl full of fresh sweet berries. Since we can enjoy them for just a short time, I love to add them in as many desserts and smoothies as possible, so a big refreshing light cheesecake was definitely in my to-do list. 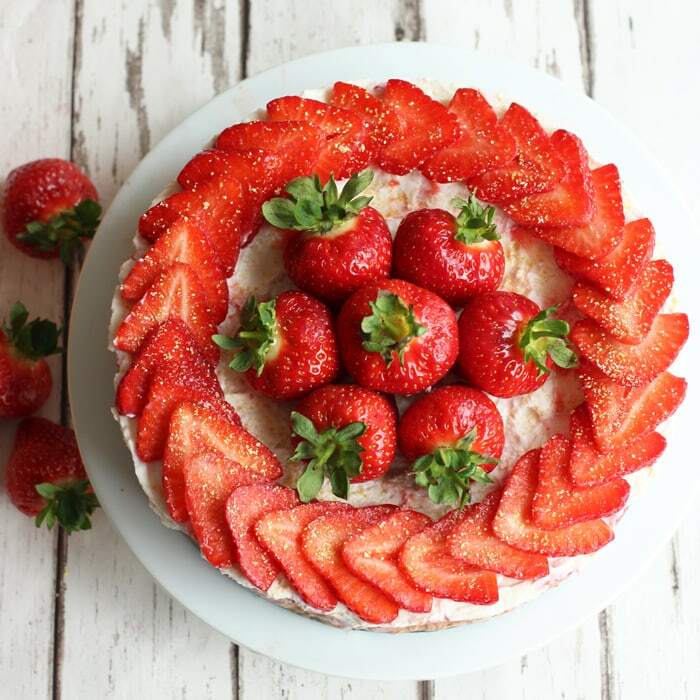 I love this no-bake strawberry cheesecake because is super easy and quick to put together –besides being highly scrumptious. I usually prepare the cheesecake in the morning and leave it in the coldest part of the fridge until the afternoon. If you don’t have time, you can also skip the base altogether and just fill dessert glasses with the ricotta cream and sliced strawberries on top. It will be just as delicious and will make an elegant dessert to serve to your guests. Not only this dessert is easy to make, but is also totally no-bake. Perfect for these crazy, hot summer days, when the last thing you want get closer to the oven. It doesn’t take more than 20 mins to make, and all you need is some dates and almond meal, fresh ricotta cheese, orange zest and of course plenty of strawberries! I’ve also added some yuzu, but if you have a hard time finding it, just substitute with a little Meyer/ organic lemon juice and zest. Yuzu is an amazing citrus fruit I’ve discovered in my recent holiday in Japan ( you can find some yummy pictures on my instagram). It tastes like a cross between a lemon, mandarin and grapefruit and has a delicate sweet & tangy flavor. Yuzu definitely makes a great addition to any dish, especially cheesecakes if you ask me. Not long time ago I made this light blueberry cheesecake and I fell in love with its refreshing aromatic flavor. If you have tried yuzu before, you know what I mean. If you haven’t, believe me it’s worth giving it a try! 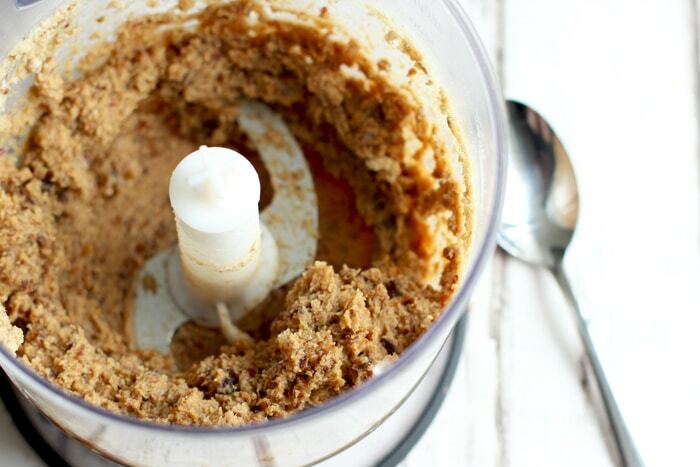 The base is smartly gluten-free and made with superfood almonds and naturally sweet dates, so you don’t need to add any sugar at all. Low in fats and highly nutritious, there’s everything to love about this base, and you can use it for all your favorite cheesecake recipes. Either bake the base for a crunchy result, or in case of no-bake cheesecakes, simply chill the base for 15 min before filling it up with a delicious creamy filling. Pretty, refreshing and secretly healthy, this no-bake strawberry cheesecake is the perfect guilt-free dessert to enjoy this summer! Put the mixture into a cake tin covered with cling film, and use your fingers or the back of a spoon to spread it evenly, pressing it down in the tin to form the base. Put the tin into the freezer to set for about 15 min. Add in the orange zest & lemon or yuzu juice, and vanilla if using. Gently mix by hand until combined. Return to the fridge until set and ready to serve (rest at least for 4 hours). Decorate with sliced and whole strawberries, and yuzu powder, then serve. Enjoy! Makes a 9 inch cheesecake or 4 individual ones. This looks amazing! I love the idea of a no-bake cheesecake! I just added the ingredients to my grocery list. Thanks for the great recipe! Thank you so much Dan 🙂 I hope you’ll love it as much as I do! Oh no 🙁 How come? Did you drain the ricotta properly? I once ended up with a very soggy filling because I didn’t drain it properly 🙁 Passion fruit sounds a sublime addition, I HAVE to try it!! Hope you’ll find it useful and can try the recipe :)! Hi Kaja! I’m so happy you’re gonna give this cheesecake a try, it really deserves it :)! I drain the ricotta through a strainer, depending the brand you use it will have more or less water in it, but you don’t really need to strain through a cloth 🙂 Let me know how it goes, and if you need any help just tweet me! I like the sound of this recipe – I made strawberry cheesecake last night using ricotta (a tip I picked up from your healthy nutella cheesecake recipe) and it was great – really light but still tasty. I won’t use cream cheese again.